how to safely give a resident their necessary insulin injection, even when they resist, struggle and fight the staff when the need for the medication has passed necessary and become urgent. how to improve staff confidence in how to safely deliver intimate personal care in confined spaces in circumstances where the behaviour of their residents can be very hard to predict. 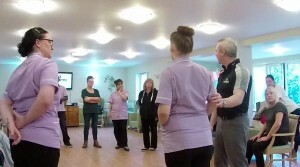 Training Director Gerard O’Dea visited the care home to deliver the training for the staff and over the course of 24 hours we had achieved feedback from the team that certain tasks were already far easier and being achieved more safely than before. Safely completing care tasks requires an uncommon sense of what residents exhibiting stress-related behaviours are likely to do, and the knowledge and skill to deal with those behaviours appropriately. As specialists, sometimes the pointers and tips that we as trainers take for granted (with decades of experience in examining the minutiae of conflict and physical confrontation scenarios) arise as a type of “common sense” to us, but can be quite opaque to staff who, after all, have as their main driver the compassionate care of others. When we reveal our modest insights about how to complete their care tasks more safely, the hints and tips can seem so simple and obvious but still somehow insightful and ingenious! We call that a type of “uncommon sense” and I believe it is why our learners consistently rate our courses as practical, relevant and useful. I’m currently working on a body of work that will help carers to learn how to develop their own “Uncommon Sense”.